... 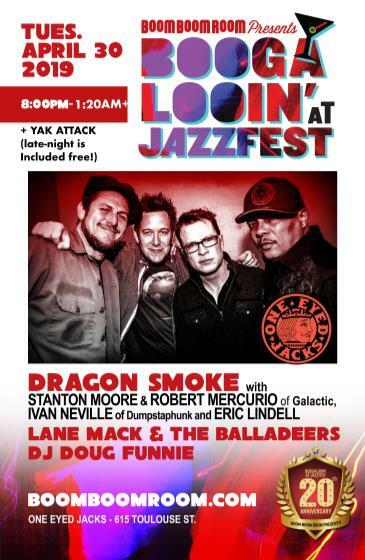 INCLUDED with your Dragon Smoke ticket purchase is the AFTER PARTY "Late-Night" Show. FACEBOOK "Dragon Smoke AT OEJ JazzFest 2019"
Born & Raised in Cajun Country, Lane Mack knows a thing or two about letting the good times Rock and Roll! From fronting a garage rock band at the young age of seventeen Lane Mack has since gone on to grace the stage with numerous national recording artists such as Robert Randolph, Marc Broussard, and Royal Teeth as well as co-founding the band Sons of VooDoo along with his brother. Lane Mack is always challenging his versatility, from playing guitar with Lafayette Louisiana folk artist Sean Bruce one night to switching gears effortlessly to soul music with season 5 finalist of The Voice Ray Boudreaux. Lane Mack owns the stage with masterful guitar licks and a vocal range that surpasses many. After years of playing and writing Lane has finally stepped out on his own to show the world a brew he’s been perfecting for years. Growing up in New Orleans and still residing in the area, Jake Smith knows his roots and influences. This 31-year-old has reclaimed his independence with vigor, selling out local shows at the House of Blues, playing shows with Grammy-award winning artists and landing a main stage gig at his hometown’s annual JazzFest just before Better Than Ezra and Dave Matthews Band. In 2015 Jake Smith opened up a recording studio in his new town of Lafayette, La.